In one of my college history classes, we read an article on the Nacirema. 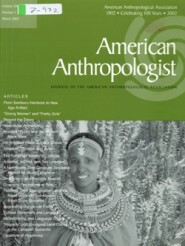 This essay originally appeared in the American Anthropologist magazine in 1956, and a subsequent article showed up in the Natural History magazine in 1972. The racs did not hold a steady position in the planetarium, but changed their relationship to the other racs rather frequently. Occasionally a special ritual, designed to emphasize man’s power over his universe, was enacted. On these unannounced occasions one or more of the planet symbols was destroyed by crashing two of them together or by throwing one against a wall. In part, both these articles were intended to communicate to anthropologists the ways they might easily misinterpret the societies which they were trying to examine. However, they illustrate important principles to a greater audience. An outsider looking in may easily place false interpretations on behaviors and perceived beliefs of a people group, and I think this often occurs when those of other worldviews look at Christians (and also many times when we look at those of other worldviews). We have traditions, words, and beliefs expressed in certain ways that may confuse those who don’t share our faith. Consequently, they may interpret them falsely or be altogether baffled by our behaviors. There are many ways of bridging this gap, but one powerful means of connection is story. And as it pertains to spiritual matters, I wonder if fantasy has an advantage in connecting with non-Christians, because it gets past many of the external trappings (which have little value anyway) and presents truth without traditions that may distract. What do you think? This entry was posted in Christian Fantasy. Bookmark the permalink. You make a great point. I think one reason speculative fiction can bridge the gap is that spirituality seems less threatening in a story that by definition takes place outside of our reality. Spec fiction can get past the barriers erected by misinformation and woundedness and free the mind to imagine the concepts of God and faith outside of real human religions. And regardless of what anyone might say, those imaginings stir the soul and stick with us long after we’ve finished the book. And regardless of what anyone might say, those imaginings stir the soul and stick with us long after we’ve finished the book. Exactly, Evangeline! I’ve heard stories of many whose spiritual journeys began with a novel that God used to take them beyond hurts of the past and give understanding of faith and the nature of God. It’s amazing that He chooses to use story–and particularly speculative fiction–in that way.